Before you store your car, attend to annual maintenance. See our offered Winter Service Special. Clean the entire car, even underneath and in the wheel wells. Fill the fuel tank to prevent condensation and add fuel stabilizer. Drive a few miles to get the stabilized fuel into the carburetors/injectors. This is especially important now that ethanol content is higher. Make sure you have ethanol safe hoses (most have green stripe or green printing) and inspect to make sure none are leaking. While the engine oil is warm, drain it and refill the crank case with fresh oil. If you change the oil filter, pre-fill the new filter with fresh oil before installing it to help prevent premature wear and tear at startup. Change brake/clutch fluid and coolant. Park the car on a sheet of plastic to keep moisture that may come up through the concrete away from your car. Remove, service, clean, and charge the battery. Clean the battery tray and cables. Store the battery in a cool, dry place off the cement floor. Check its state of charge every month. Use a good quality automatic trickle charger (‘Smart’ charger/battery tender). Cheap chargers may over-charge your battery which will damage it. Make a note to remind yourself where you put the mothballs. Alternatively, laundry ‘dryer sheets’ deter rodents and you may prefer the smell. Place several in the interior and in the engine compartment. 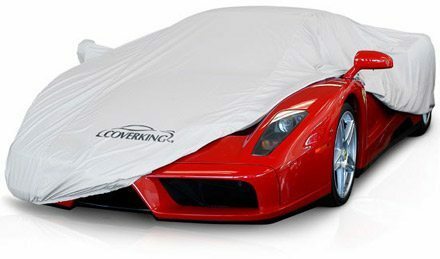 Use a cotton car cover that can breathe. Never cover cars long term with plastic, particularly out of doors. Plastic will trap moisture under it and sunlight will bake it onto the paint. Once per month roll the car forward or backward a foot or so to prevent flat spotting the tires. This is particularly important for older cars with bias ply tires. If the car is to be stored for an extended period, you might want to consider jacking it up and resting the frame on stands. Just keep in mind that in the event of a catastrophe such as fire or flood your car will be difficult to extract quickly. A heated storage area is nice but it should be ventilated or dehumidified. Cold but dry is better than hot and humid. Remember that standard dehumidifiers don’t work under 40 degrees Fahrenheit. For low temperature storage the thing to have is a desiccant dehumidifier.